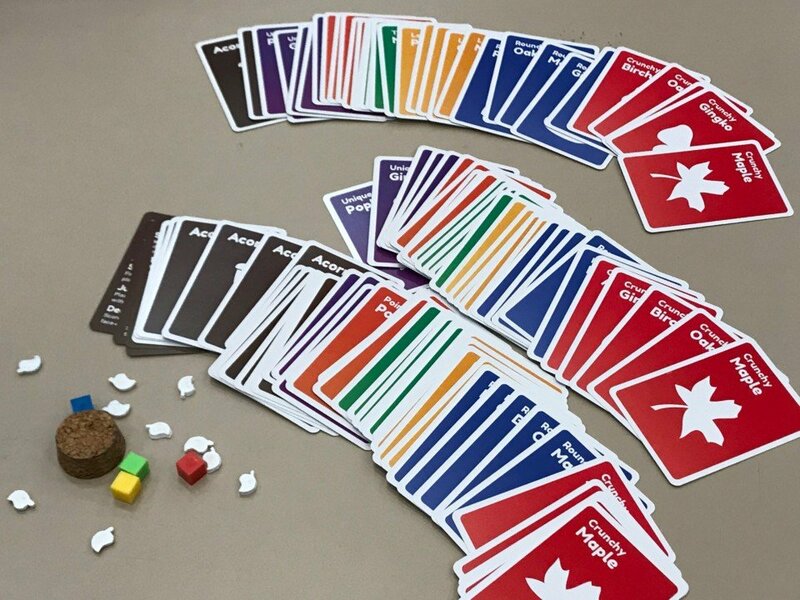 At various playtesting events, including San Jose Protospiel, people invariably ask me where I get my cards printed from. I get my cards printed through Printer Studio. For the most part, they’ve done a great job at taking the art I have and reproducing it on high-quality cards. Printer Studio has a variety of standard card sizes (poker, tarot, mini, etc.) 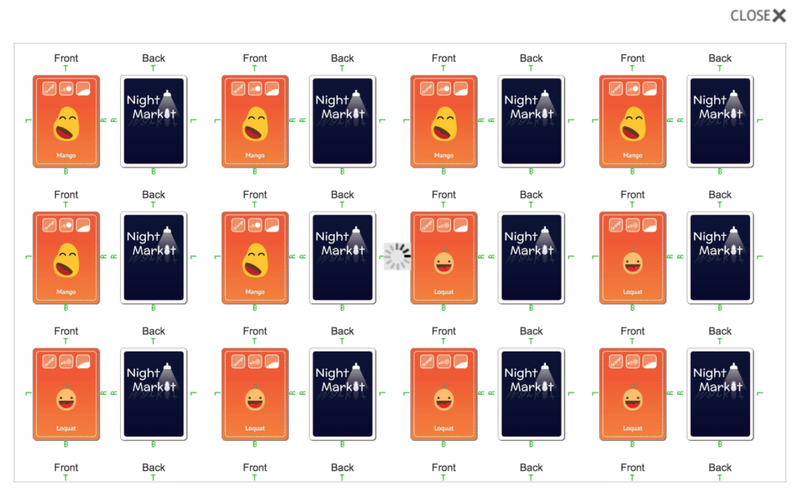 and configurations that you can use to create your cards. For my cards, I use “Personalized Poker Custom Cards (Blank Cards) Playing Cards” with the 310gsm linen finish to make the cards more durable. Depending on the number of cards you order, you may or may not be able to get a box for it. Every time I’ve ordered, I’ve only been able to get my cards shrink wrapped. The cards arrive in a nicely packaged box regardless. 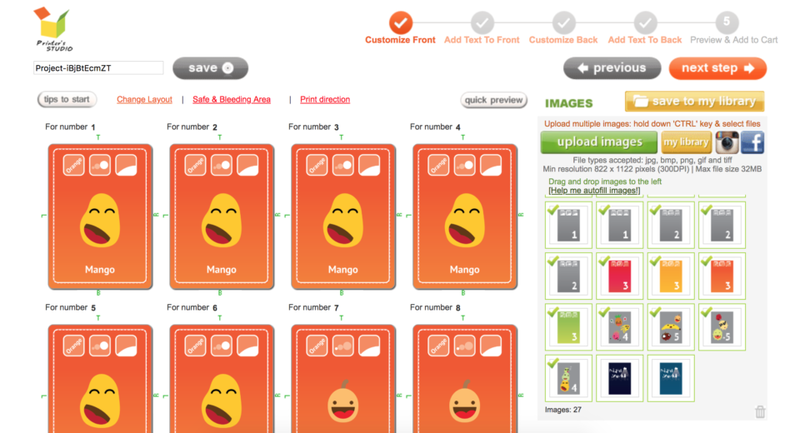 Once you’re ready to submit your design, click on the Personalize button. You’ll then be taken to a page with a randomly generated project name. In the middle of the screen, will be some information for you to process. 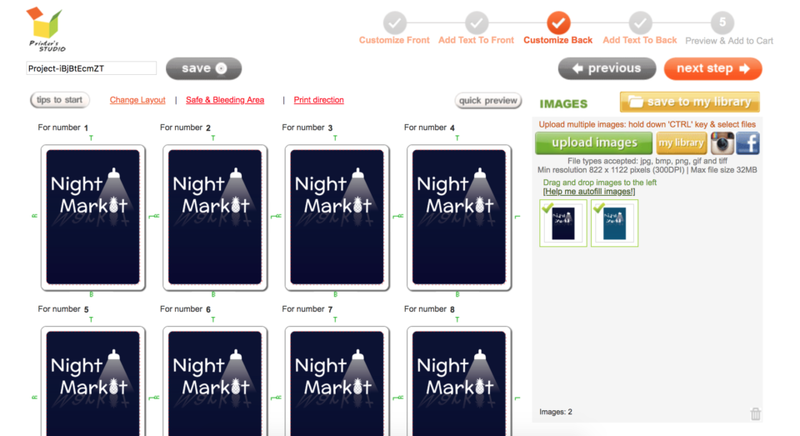 If your card backs are all the same, you can later choose to to apply the same image to them. For now, choose the blue “different images” button (unless you want your fronts to be all the same, in which case you should choose the “same image” option). 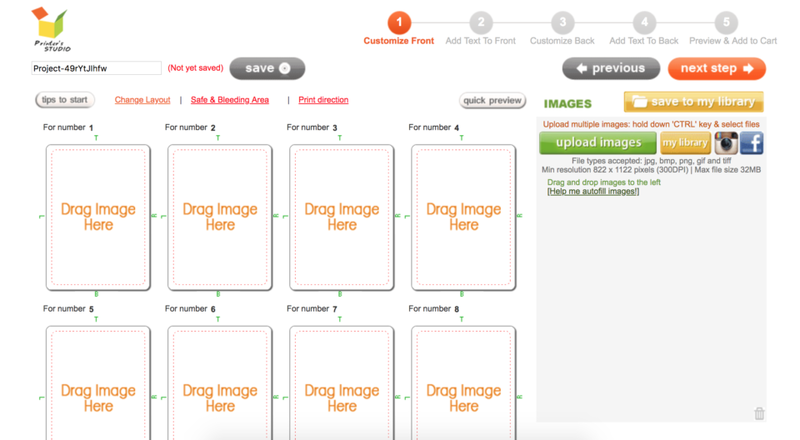 Press the “next step” button to add any test you want to your cards. This is completely optional. Because I already have designed my cards with text, I just skip this option and click “next step” again. Time to do those backs! On the next screen, you’ll get to add your card back images. For me, because I often have more than one card back, I have to go through a similar process as applying the fronts. Card backs are applied to their card fronts in respective order, so that first image you applied will be card one with any background you post for card one in the background step. If you’re not completely sure how fronts and backs line-up, you can click the “quick preview” button. When you’re finished with the card backs, click “next step” to go to the optional add-text-to-background section. Again, I usually skip this. Clicking “next step” one final time takes you to a preview pages which kind of resembles the quick preview page. This page allows you to look over all of your cards and make sure that they match. You then have the option of saving the project to your account and/or adding it to your cart. Be aware that what you see on screen may not look like what you get in print. 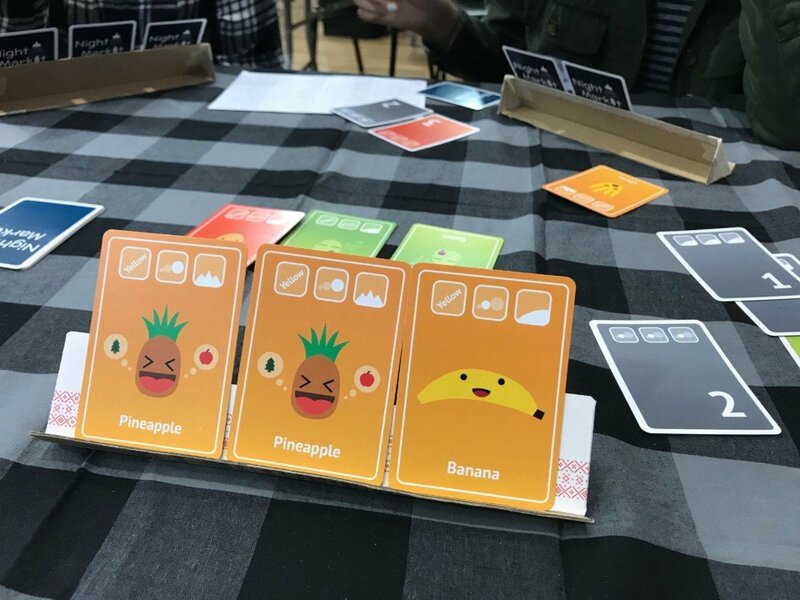 This happened in terms of Night Market, where the background on my orange fruit card nearly resembled those of my red fruits. Imperfections may happen. Such was the case of a mis-cut card and a card where a part of the printing job was smeared. Maybe it was a speck of dust or something that landed on the printer. Using design template can help ensure that you leave just the right amount of space for cutlines and bleeding. The templates are on their website under each personalize button. All in all, I’ve been quite happy with Printer Studio and will continue using them as I further develop the various games I’m working on.